Applications are now open until the 15th of May 2019, at midnight, local time (UTC+2). Over the past few decades, the city has seen the appearance of a large number of more or less spontaneous initiatives that operate outside the traditional broad restrictions of urban planning (transport, economy, housing, etc.). The temporary use of buildings, occupation of uncultivated land or wasteland, urban planting initiatives – these ways of collectively appropriating space for social or cultural purposes give residents the possibility of being contributors to part of the development of their environment. By proposing new uses, they question our way of building our territory together, and intend to influence the city of tomorrow. 2) Download the questionnaire on your computer, do not fill it in online. These two documents need to be sent at the email address provided in the questionnaire. 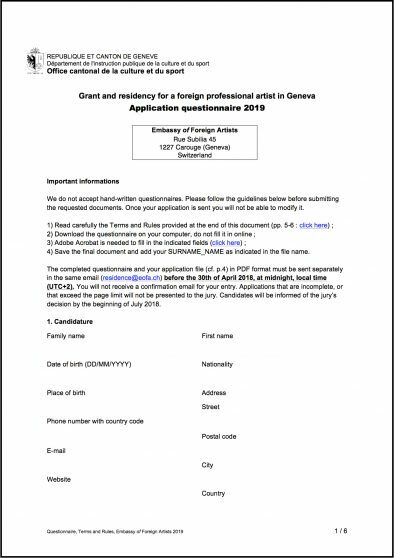 Note : if you are applying for a residency with an artist collective (maximum 3 pers. ), you need to send us a single email with one application file and a questionnaire for each member.